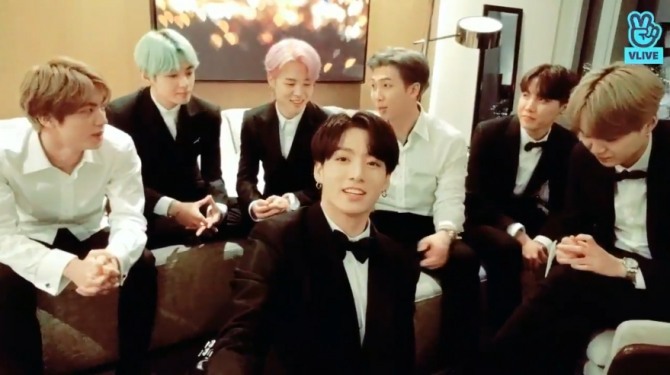 BTS was wowed and inspired by performances by well-known artists at the Grammys and wants to be among them onstage next year, the band members said on V Live early Tuesday. Livestreaming from a hotel room in Los Angeles, the bandmates shared about attending the US music awards as presenters. The septet became the first K-pop act invited to present an award at the event. It gave the best rhythm-and-blues album award to H.E.R. Despite having practiced saying that phrase in unison, the band failed to deliver it in harmony onstage. “We were there to say that short phrase!” RM said. Jimin revealed his encounter with Shawn Mendes in front of a restroom. “He recognized me and we shook hands,” he said. J-Hope and other members said they also shook hands with him inside the restroom. Many staff recognized the band and even addressed them in Korean, Jin added. The bandmates then shared the most unforgettable moments and performances of the night and thanked fans. “I was totally wowed by the first performance by Camila Cabello. Watching her perform, I thought next time we should perform there, too,” the green-haired V said, with others nodding in agreement. They also mentioned performances by H.E.R., Cardi B, Shawn Mendes and Travis Scott, and expressed regret at not being able to watch Lady Gaga’s as they were busy preparing to present the award. “Every performance was so amazing. They were like the ultimate performances an artist can think of,” RM said. Jin said he had never dreamed that they would be invited to the Grammys. “Billboard? Yes. I thought about it. But Grammys, no. I have never even dreamed about it,” he said. “Really, this is all thanks to Army. Army brought us here,” J-Hope said, referring to their fans. 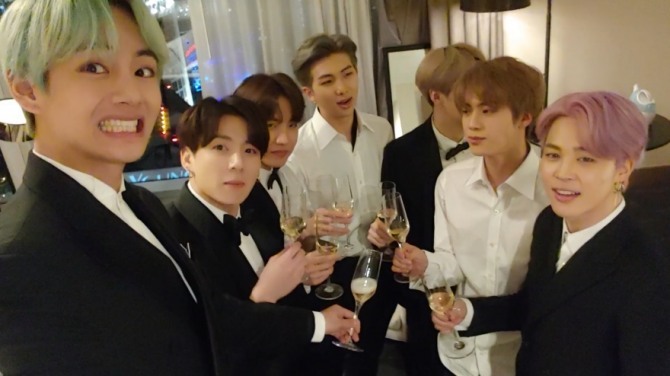 At the end of the livestream, the bandmates had glasses of champagne to mark the night, though Jin pointed out they hadn’t received an award. “Coming to the Grammys is worth celebrating,” others said. The toast, started by RM and joined by the rest, was “and the Grammy goes to … BTS!” They said it in perfect unison this time. Dino of Seventeen celebrated turning 20 on V Live, saying he is the luckiest person to receive so much love from band members and fans. “I received a lot of messages from people around me as well as fans wishing me happy birthday,” he said at the start of the 22-miniute livestream. All 13 members of the band had gathered for dinner the previous evening to celebrate the youngest member’s coming of age. “My bandmates are busy with their own things. To gather together like this for my birthday was really great,” he said. Bandmate Vernon joined Dino in the broadcast, with the two casually chatting. 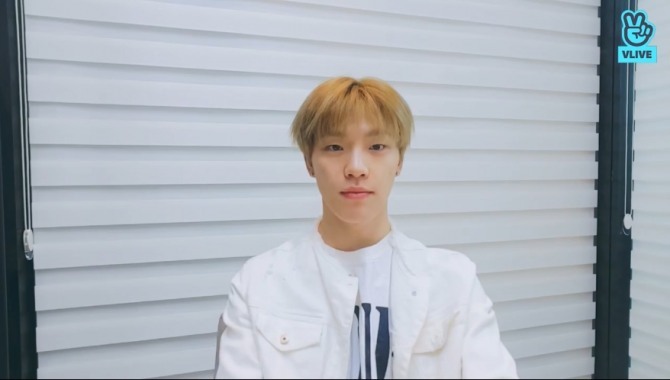 Watch Dino’s B-day V live at https://www.vlive.tv/video/112695. The full video of Taemin’s album showcase event, held Monday in Seoul and streamed real-time on V Live, is now available for replay on S.M. Entertainment’s V Live channel. With Super Junior’s Eunhyuk as the host, the showcase lasted for 1 1/2 hours, with Taemin talking about the album track by track and performing the title track for the first time. Watch the video at https://www.vlive.tv/video/112181.